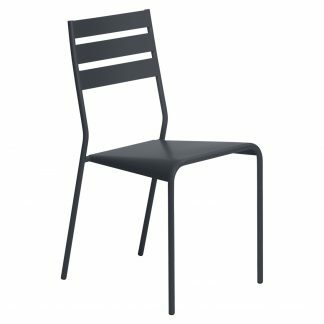 The resolutely contemporary Facto chairs, with elegantly understated lines. Awarded the prestigious VIA (Valorisation de l’Innovation dans l’Ameublement – Development of Innovation in Furniture) Label, in particular for seamless transition between the seat and the tubing of the feet; typical of the approach adopted by its designer, Patrick Jouin; a master of creative thinking when it comes to using different techniques to innovate and surprise. 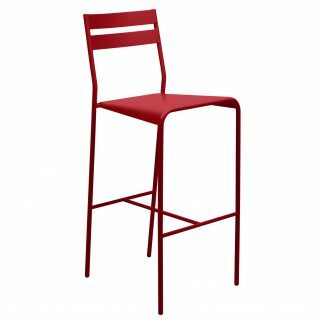 The Facto range comprises a chair and bar stool that take up no space at all and boast ultra-simple yet distinctive lines; making them instantly recognisable from a distance! Also, available in all the Fermob metal colours.